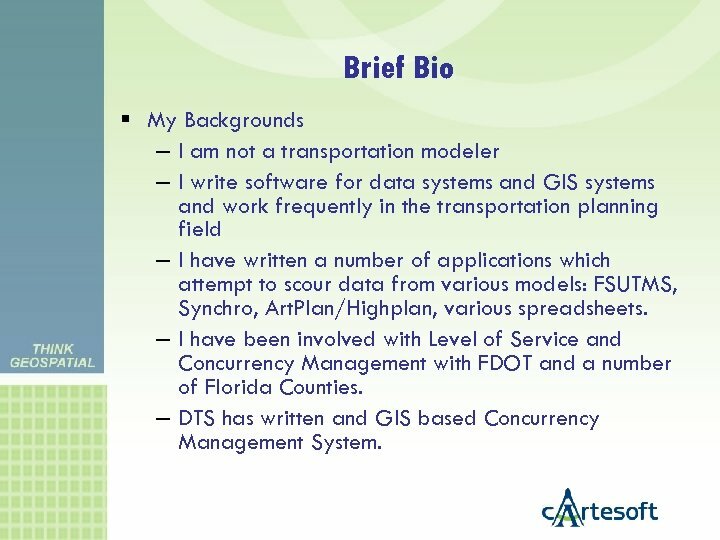 Brief Bio My Backgrounds – I am not a transportation modeler – I write software for data systems and GIS systems and work frequently in the transportation planning field – I have written a number of applications which attempt to scour data from various models: FSUTMS, Synchro, Art. Plan/Highplan, various spreadsheets. 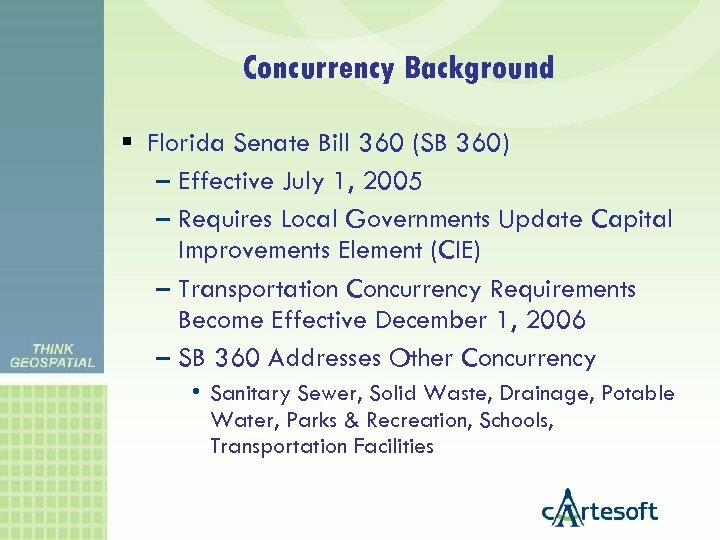 – I have been involved with Level of Service and Concurrency Management with FDOT and a number of Florida Counties. 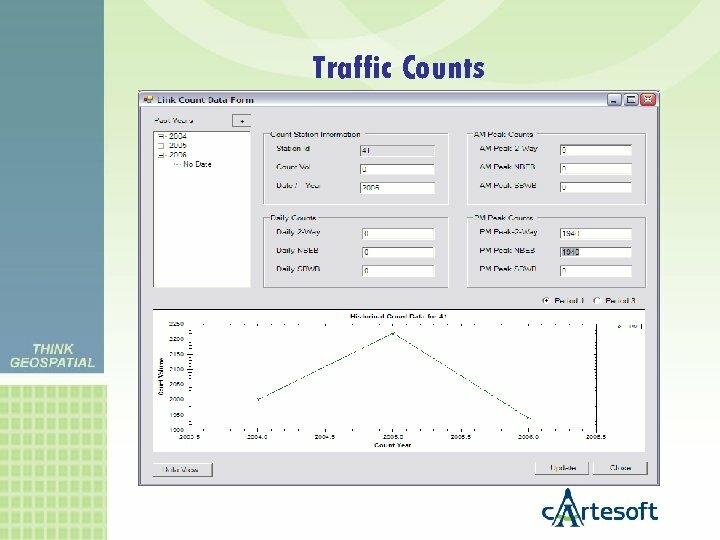 – DTS has written and GIS based Concurrency Management System. 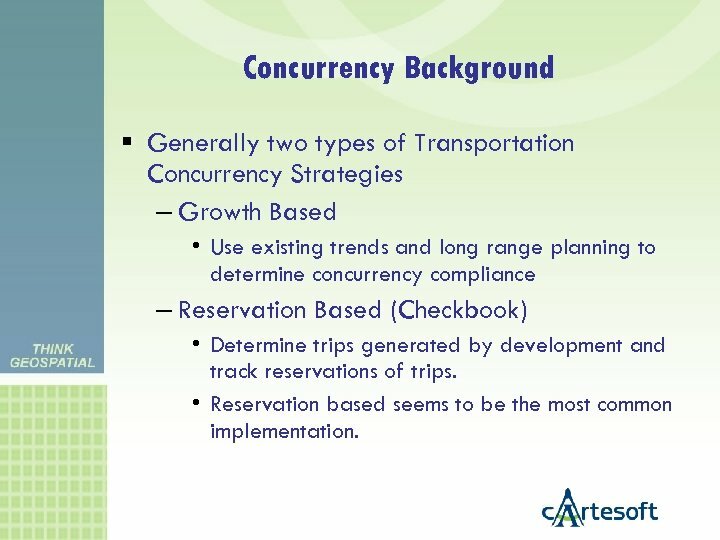 Concurrency Background Generally two types of Transportation Concurrency Strategies – Growth Based • Use existing trends and long range planning to determine concurrency compliance – Reservation Based (Checkbook) • Determine trips generated by development and track reservations of trips. • Reservation based seems to be the most common implementation. 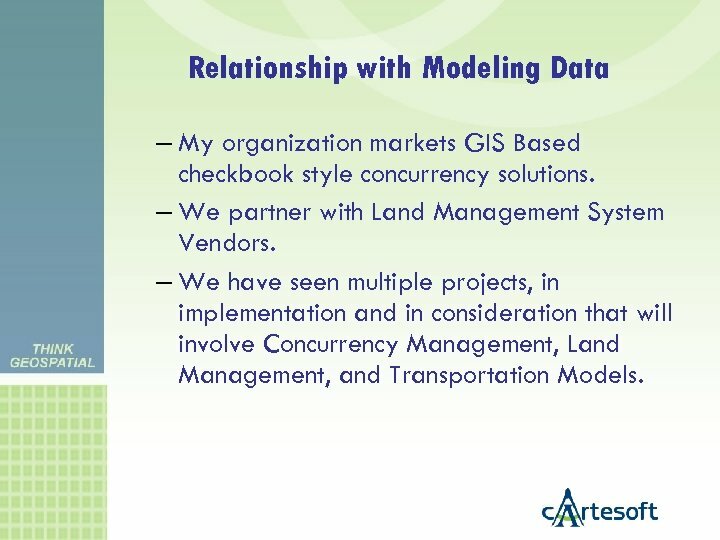 Relationship with Modeling Data – My organization markets GIS Based checkbook style concurrency solutions. 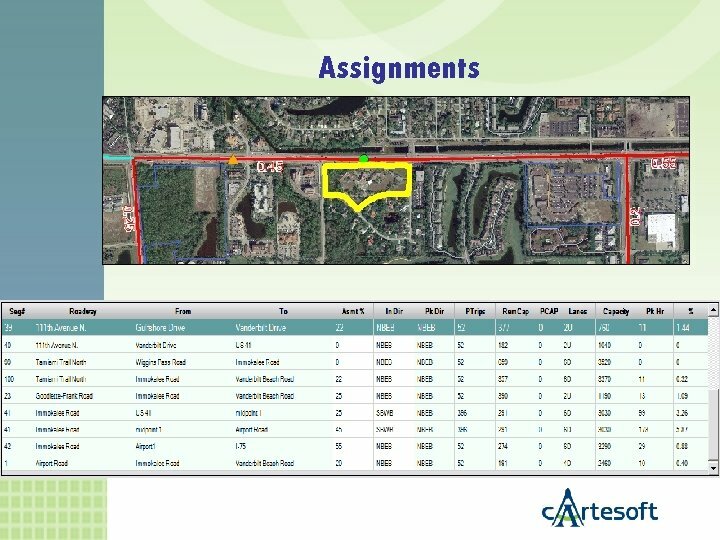 – We partner with Land Management System Vendors. 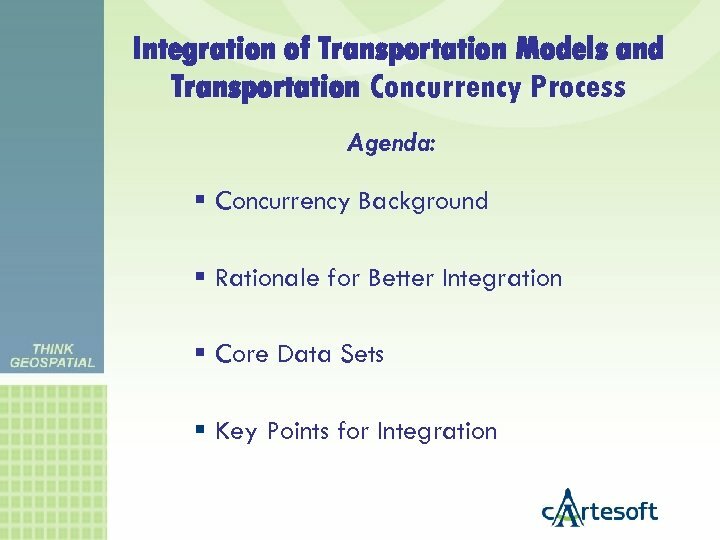 – We have seen multiple projects, in implementation and in consideration that will involve Concurrency Management, Land Management, and Transportation Models. 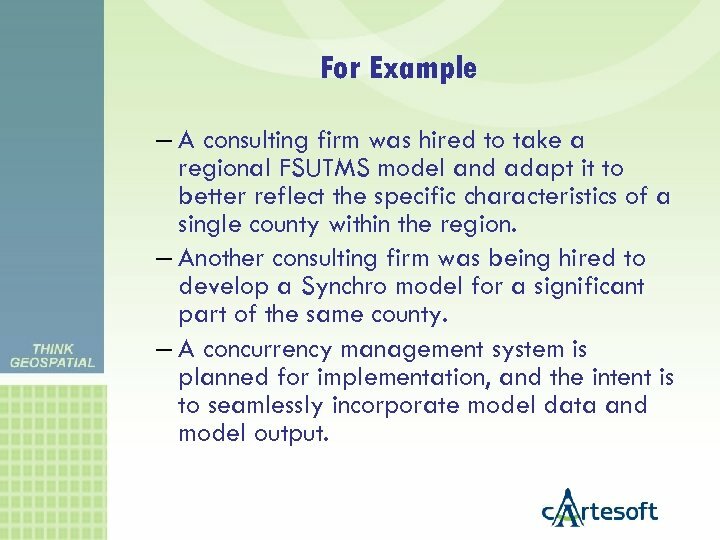 For Example – A consulting firm was hired to take a regional FSUTMS model and adapt it to better reflect the specific characteristics of a single county within the region. – Another consulting firm was being hired to develop a Synchro model for a significant part of the same county. 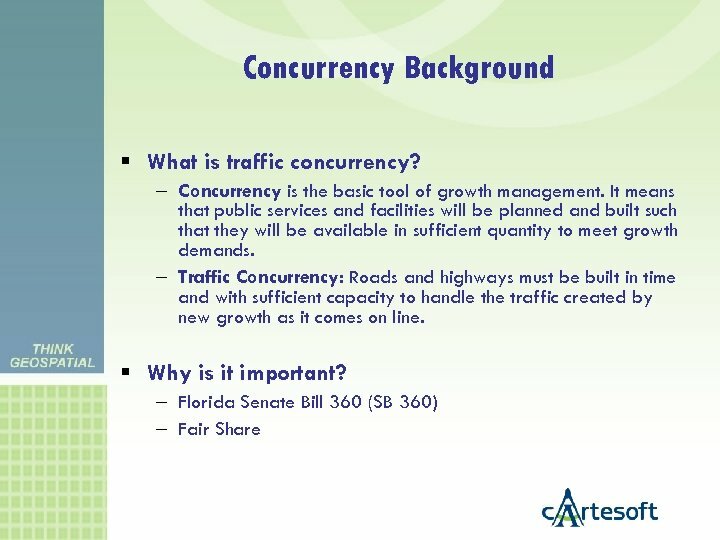 – A concurrency management system is planned for implementation, and the intent is to seamlessly incorporate model data and model output. 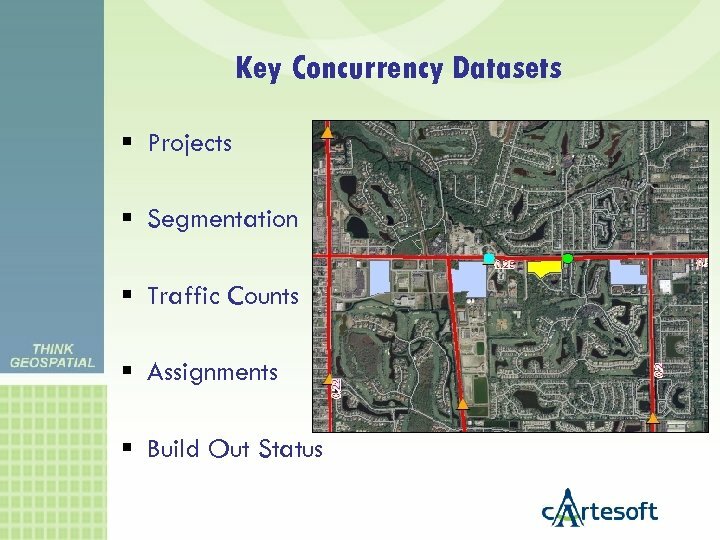 A Second Example – My organization implemented a concurrency management system in Southwest Florida. 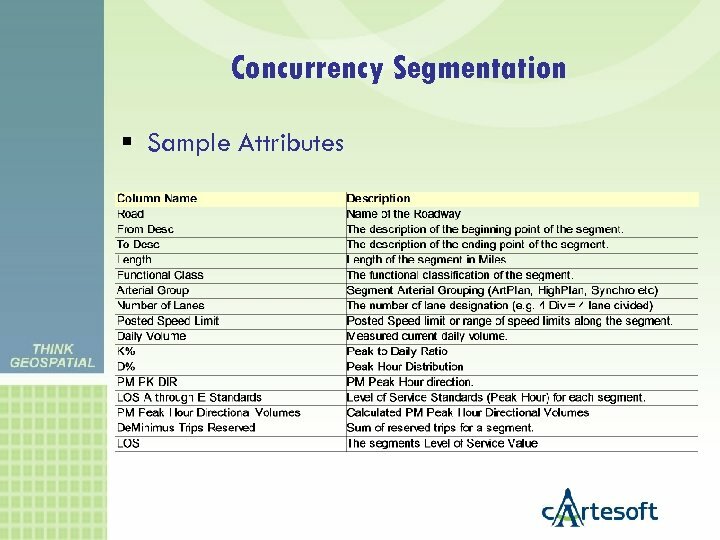 – To deploy quickly, we initially imported existing concurrency information which was derived from models (Synchro). 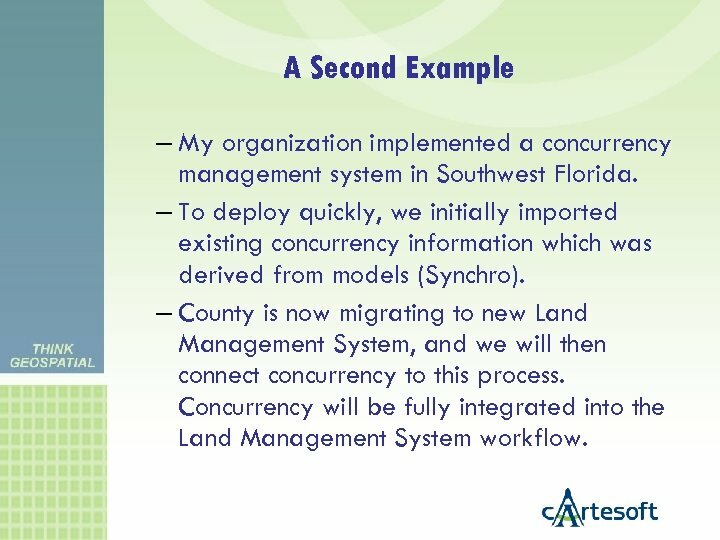 – County is now migrating to new Land Management System, and we will then connect concurrency to this process. 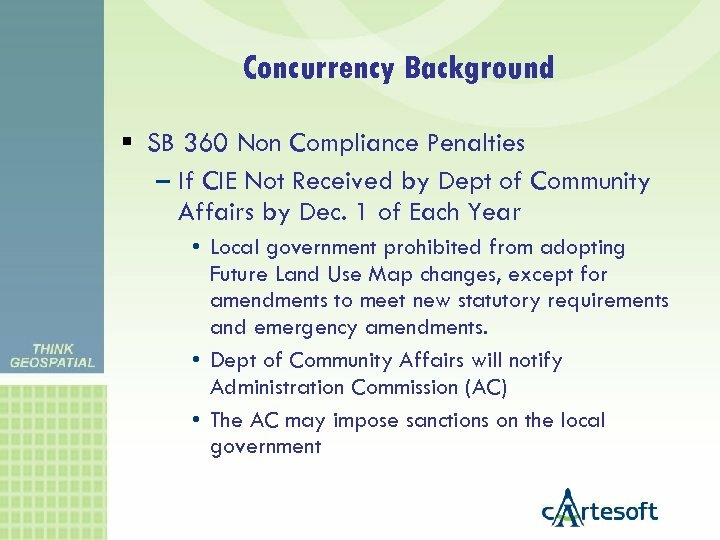 Concurrency will be fully integrated into the Land Management System workflow. 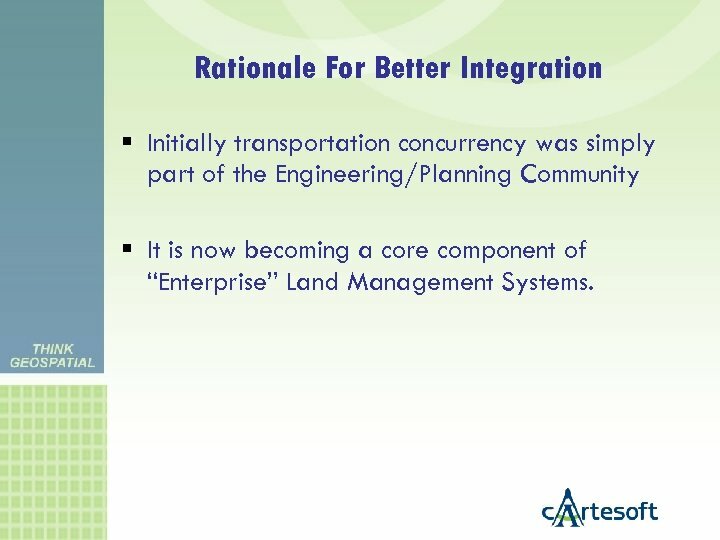 Rationale For Better Integration Initially transportation concurrency was simply part of the Engineering/Planning Community It is now becoming a core component of “Enterprise” Land Management Systems. Rationale Contd. 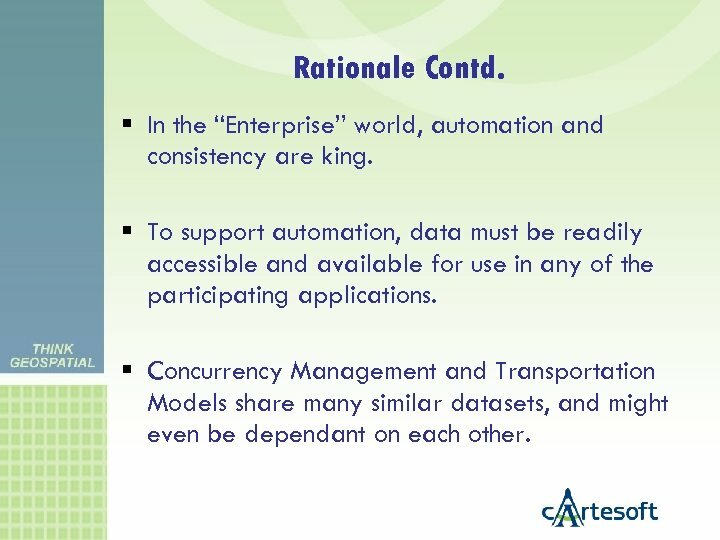 In the “Enterprise” world, automation and consistency are king. To support automation, data must be readily accessible and available for use in any of the participating applications. 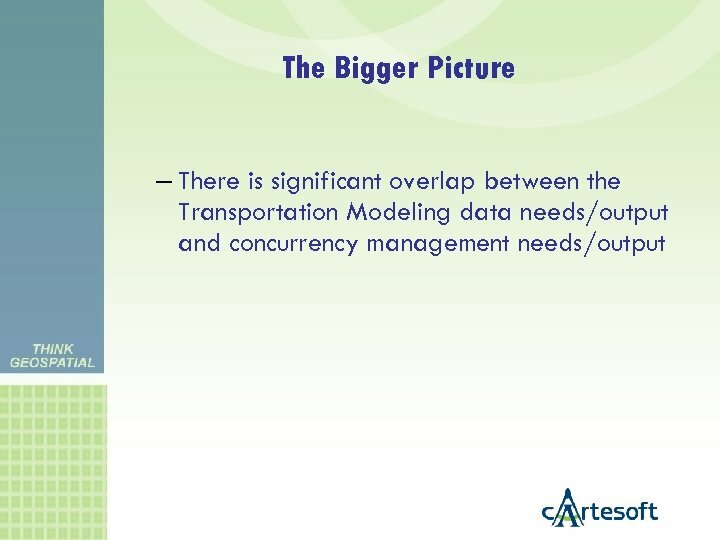 Concurrency Management and Transportation Models share many similar datasets, and might even be dependant on each other. 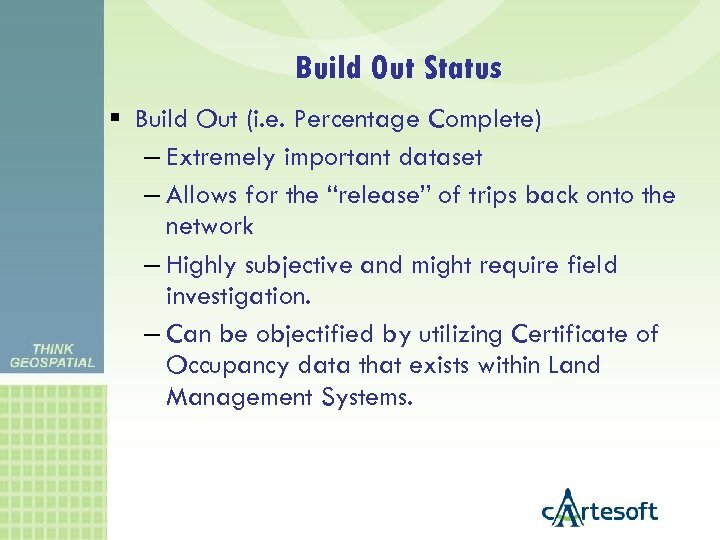 Build Out Status Build Out (i. e. Percentage Complete) – Extremely important dataset – Allows for the “release” of trips back onto the network – Highly subjective and might require field investigation. 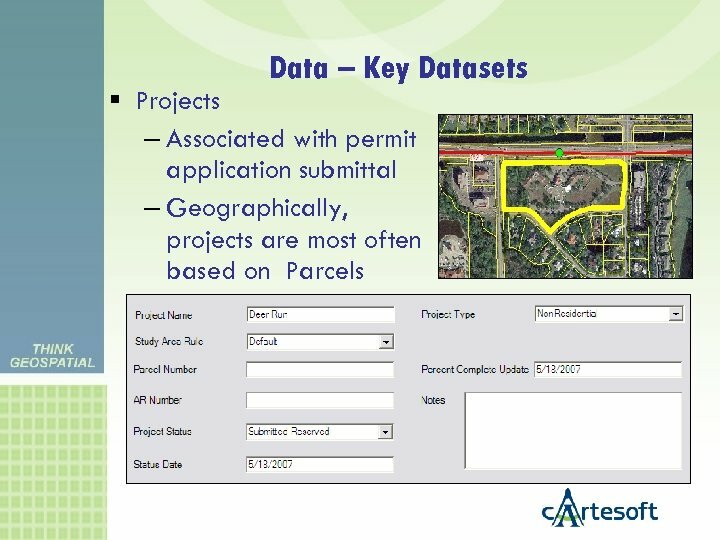 – Can be objectified by utilizing Certificate of Occupancy data that exists within Land Management Systems. 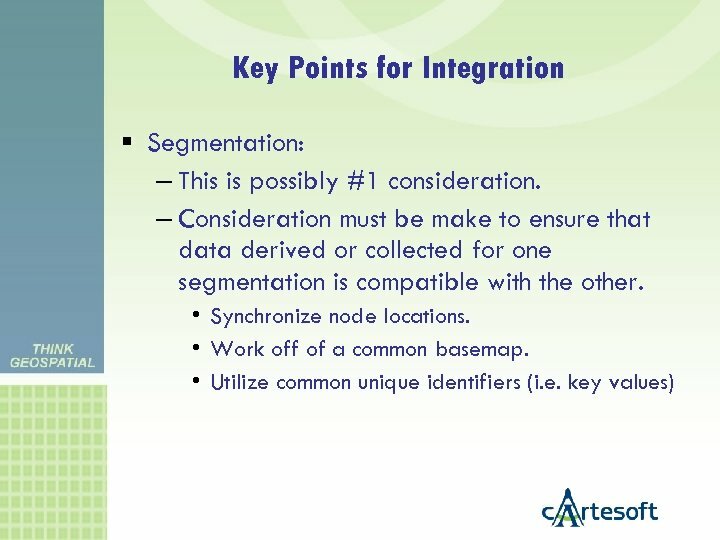 Key Points for Synchronization Data Standards – As professionals, create standards bodies and develop standards. – Push vendors to implement these standards. UTDF is example of existing standard. Move beyond flat file storage. 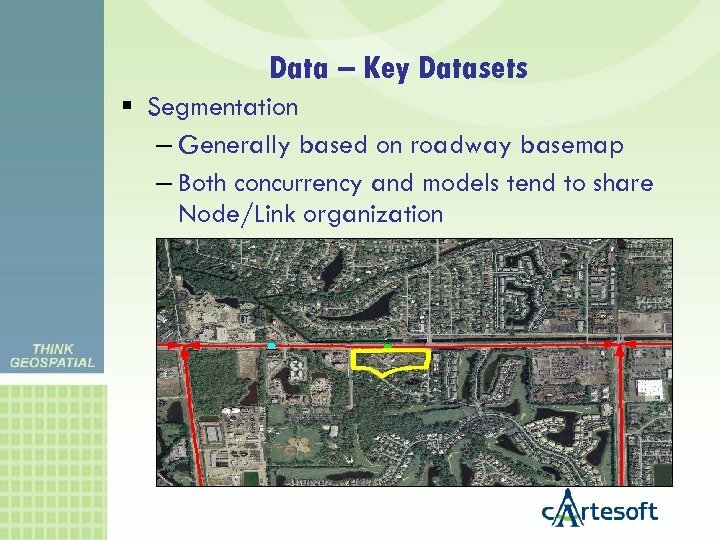 Transportation modeling incorporates and generates a tremendous amount of data, much of which is useful to others. 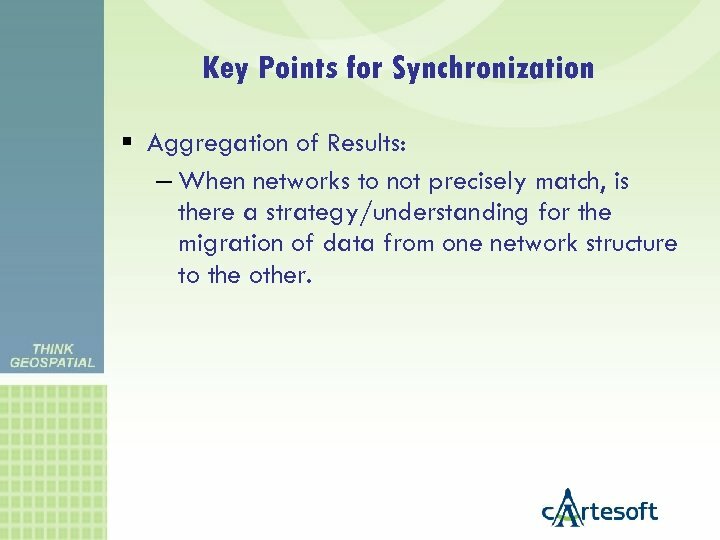 Key Points for Synchronization Aggregation of Results: – When networks to not precisely match, is there a strategy/understanding for the migration of data from one network structure to the other. 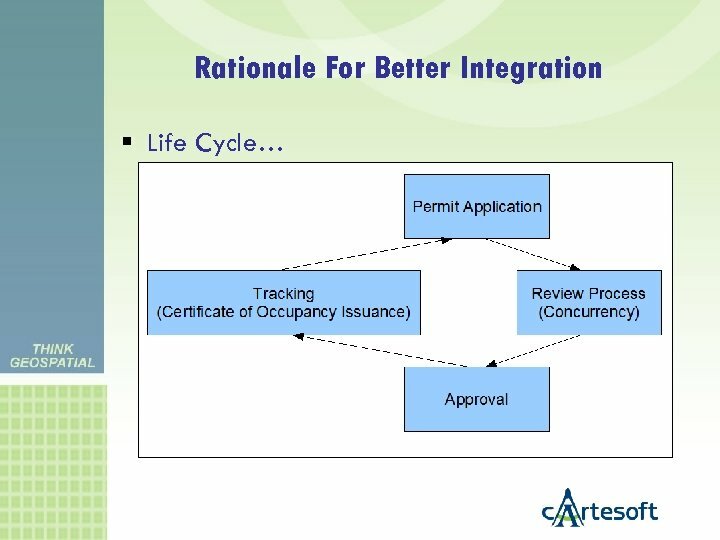 In Summary There is a trend towards formalization of concurrency processes and incorporation of these in Enterprise Municipal Workflows. 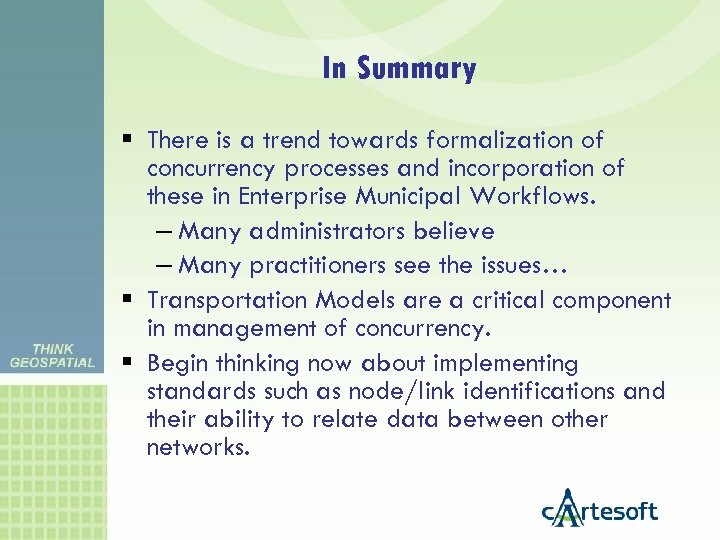 – Many administrators believe – Many practitioners see the issues… Transportation Models are a critical component in management of concurrency. 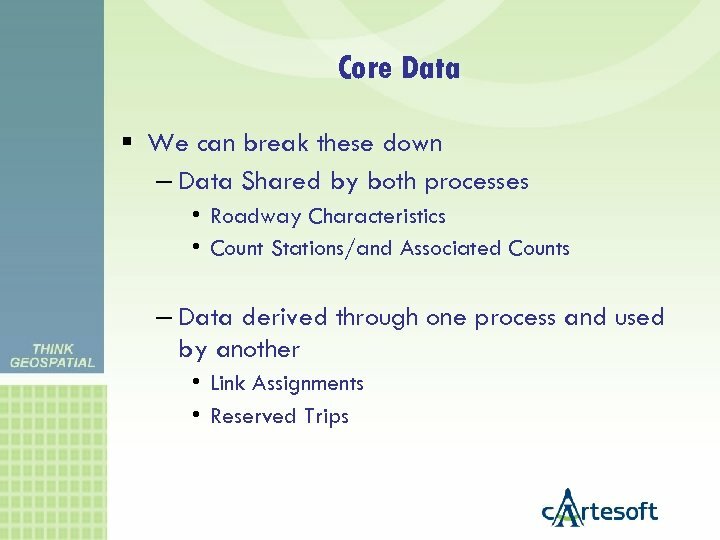 Begin thinking now about implementing standards such as node/link identifications and their ability to relate data between other networks.